It is usually not an easy process to vote overseas. And then, all of a sudden, I had. Weeks ago we printed out our internet registration form, necessary to secure a ballot sent from America. 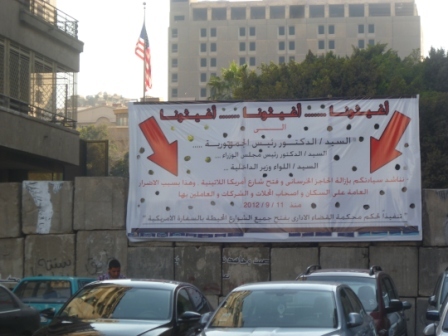 We also heard we could drop this off at the US Embassy in downtown Cairo, but delays – including a few days of rioting you may have heard of – kept us away. But even then the process was complicated. Even after we received the ballot and sent it back, it was still necessary to physically mail an official registration form, even if it arrived late. It has been a while since I voted in America, but basically all I recall is signing my name and pulling a lever. There is much I took for granted. This includes, apparently, not having to walk through a war zone. I exaggerate. Everything downtown is calm and has been for weeks. But the earlier riots only ended when the army intervened to impose its staple post-revolution solution: Build a wall. The main street of access to the embassy from Tahrir Square is now barricaded completely, forcing a five minute walk around the corner. Didn’t I just lament taking things for granted? Now I complain about an extra five minute walk? The sign on the wall shows those who have a right of grievance. The shop owners outside the embassy and all along the now barricaded road are pleading with the government to take it down. Once around the corner, however, the second security step is visible. 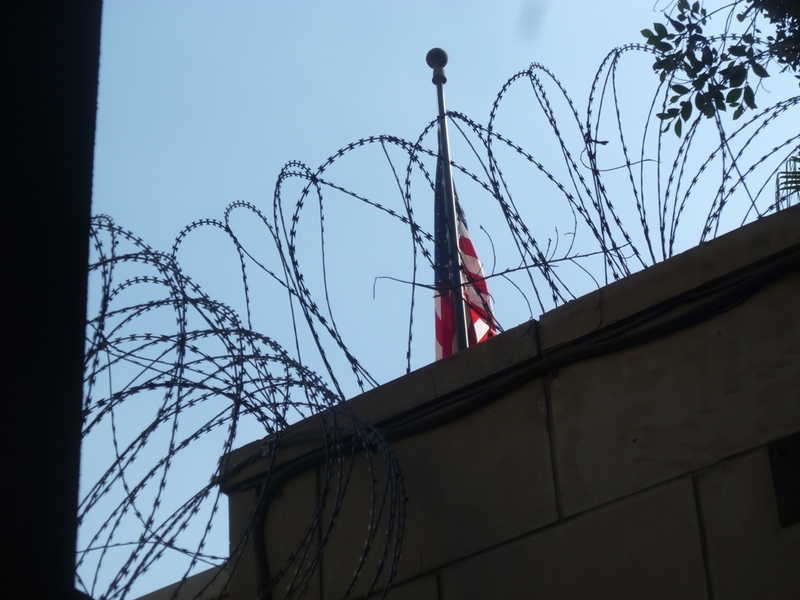 During the original demonstration against the film protestors scaled the embassy walls and took down the US flag, replacing it with a black flag of Islam. The rest of the evening they stood atop the wall, holding placards but doing nothing in particular. 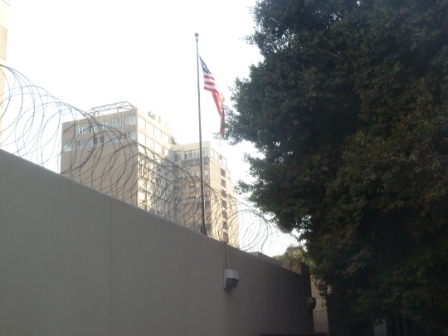 Now, barbed wire lines the embassy wall in its entirety. Getting in was nearly as simple a process as usual. There was a line outside, ID, phone, and camera to leave at the desk, a metal detector to pass through, and then… that’s when things were different. Normally the American Services Center of the embassy is calm and orderly, waiting in turn for your number to be called. The embassy advertized two days, however, to assist the absentee voting process, which was held outside regular visiting hours. The line outside was due to the great crowd, let in by smaller groups to ease the congestion. There were few instructions given on what to do upon arrival. Forms were everywhere – mostly organized – but only one very helpful and very patient embassy employee inside. I had figured I only needed to drop off my ballot request form, so I was a bit confused. And then she handed me my ballot. I wasn’t quite prepared to vote on the spot. The main problem is that my attention is given almost entirely to Egyptian politics. Outside the headlines, I haven’t followed the US race much at all. Basically, I hadn’t done my homework, nor had I reflected sufficiently. The only solution was to pray quickly, swallow hard, and write down a name. With that, it was over. My envelope was sealed and placed in embassy mail. I don’t even have a hard copy registration letter for later, as they mailed that too. Really, it was wonderful facilitation by the embassy, and a good reminder of the blessings of our system. It was a responsibility to cast a vote, but it was also a privilege.